As you can see the design was a bit of a mess but then again a lot of my files end up that way as I test thing and sometimes just struggle with sketchup's quirks. I started the build with the cylinder. After working out the vectors for the details in inkscape, I prepared a sheet of styrene by attaching it to some craft foam with Super 77 spray glue. In recent months, its become clear that Barge is MUCH better for this. Barge will actually soften the styrene and create a great bond. The Super 77 would debond if heated for bending and shaping. The combination of these two materials is great because they are flexible and strong enough to stand on their own. This meant the interior of the Cylinder could be more open with now MDF to support it. It also allowed me to etch finer details into the styrene that wouldn't have look as good in the foam. The interrior of the cylinder was cut from 3mm MDF. It has a small hole in the center for the fiberglass rod that we will be using to make the blade removable. 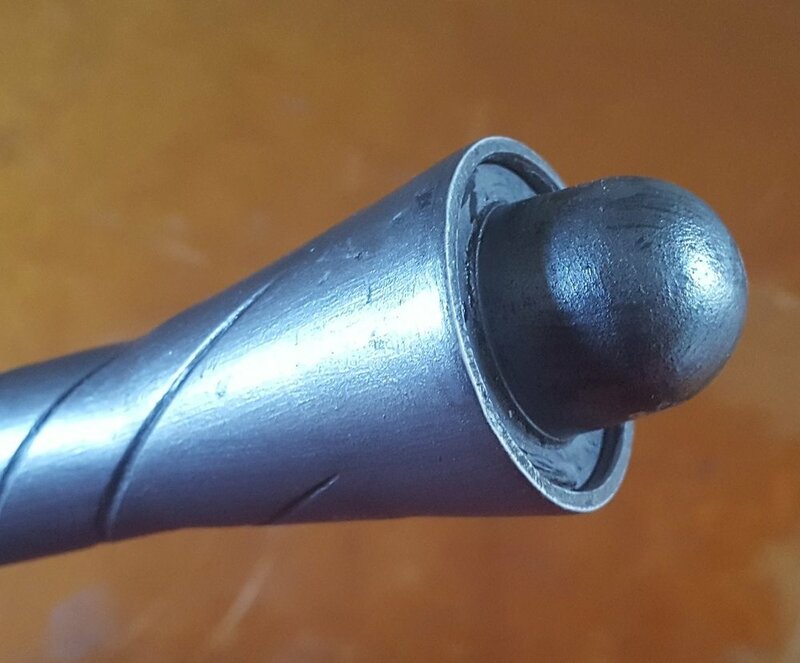 The larger hole on one side fits the PVC pipe for the grip and the other side has a pass through large enough for the connection on the fiberglass rod. Next I finished the design and cut the rest of the pommel pieces in the laser. This is where things got tricky. Most of the parts worked but several needed to be redone and tweaks. 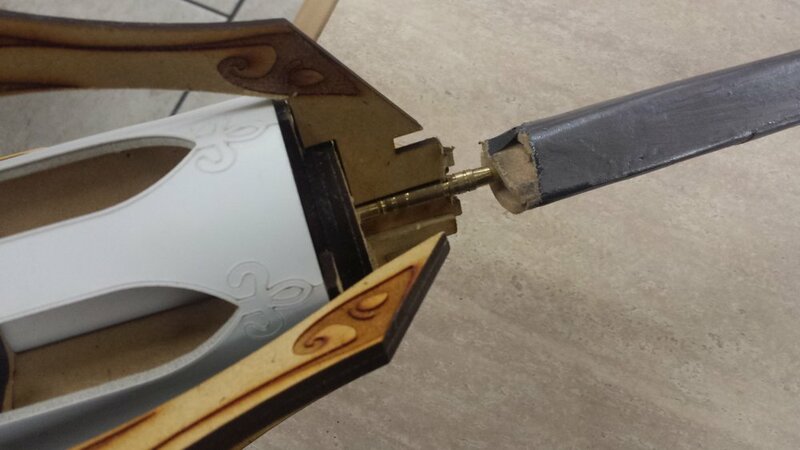 Namely the front bits where the blade would go through. The grip and pommel flair where rather interesting to get right. Tried several methods to flair the tube but nothing was working. Eventually I settled on a toaster oven to heat the end and a custom plug that I laser cut from MDF. It was a series of stepped disks. After that it was heat the tube... slam it with the hammer a dozen times and repeat till done. In hindsight I would have added something to the bottom of the plug to stop it from necking down there. I got it out by heating it again with the plug inside and pulling it out a bit. This did leave some steps in the outside and inside of the tube. I sanded those out easy enough. The first prototype of the blade wasn't good. Not sure what I was thinking however the fiberglass rod works great! These are rather cheap at Harbor Freight. They are cable pulling rods. I think I paid $10 for 10 sticks. The connectors are metal and they work great for connecting buts together. The rod will go all the way to the bottom of the pommel to create a twist connection to remove the blade. Luckily I have awesome friends! My buddy who worked in a theatrical scene shop at the time wanted to try something. He ripped these out on his table saw with a custom jig... still sad that it got misplaced in his shop. I also don't have a table saw yet so it wouldn't do me much good. It came out great! I cut the end off one of the fiberglass rods and epoxied it into the end of the wooden blade. The blade fits great and looks great... Till I dropped it in a parking lot at a con but that's a story for another day. Now to paint! I used a latex paint for this. This was rather expensive but I loved the color. However, I don't think I'll do this again. It wasn't a great paint to work with and was specifically hard for the plastic parts. As a side note, Mixing this Ralph Lauren metallic paint with PVA makes an interesting mess. The grip has grooves in it and those where a challenge. I ended up gluing copper wire to the pipe in the form I wanted. Then I used a dremel to cut along it and get a close to perfect spiral. This was specifically good for the pommel as it widens. Now all I need to do is fill this gaping hole in the back of the prop. I laser cut and sanded down an MDF disk to plug the end but I needed a round bit for the end. Digging through my scrap bins I found a small plastic toy bubble. Now all I needed to do was fill it. I decided to go with bondo. This created a hard plastic shell that was strong and could be the anchor for the fiberglass rod. Now the pommel is complete. I didn't glue the MDF plug in. Rotating the knob on the end will unscrew the blade and it can be removed. It works great! The only thing left to add was the dust chamber. These were rushed and I've been meaning to redo them. They are PETG cut and heat bent to fit into the slots but I didn't really design it to have them in there. I initially thought about using glitter vials but I couldn't get them to look right. So I ended up using hot glue and super glue to quickly attach the PETG plugs into the holes and called it done. We are calling this mk1 and plans are to eventually redo it but after I get a 3D printer and can make the blade spin and index with the trigger pull. All in all the project was a great learning experience and tested several theories. And now we have a complete set for team RWBY! At that con we ended up with 6 members total including, Torchwick, Adam, Weiss, Ruby, Jaune, and Yang. Looking forward to working on MK2 Myrtenaster in the future! Weiss' jacket has an ornate pattern on the back of the jacket. So I decided to help out by laser cutting it. Heat and bond was used applied to the glossy fabric and then we loaded it into the laser and cut it. After it's applied to the more matte jacket it creates a great look! The final element I made for the costume was the hair piece. This is cut from 1.5mm acrylic and uses a hair clip to make it easy to attach to the wig. All in all Weiss was a fun project and Steph is now planning a Season 4 Weiss costume so we will probably be revisiting this project in the near future and looking at a Myrtenaster Mk2!